Mama: Out now! Your sister and brother are already flying. Baby: Well I’m not my sister and brother. I’m my own bird. Mama: Look, I’m your mother and I KNOW when it’s time to fly and it’s TIME. Baby: But it seems a little windy. What if I crash? Mama: You won’t crash, dodo bird. You have wings! Just keep them open. 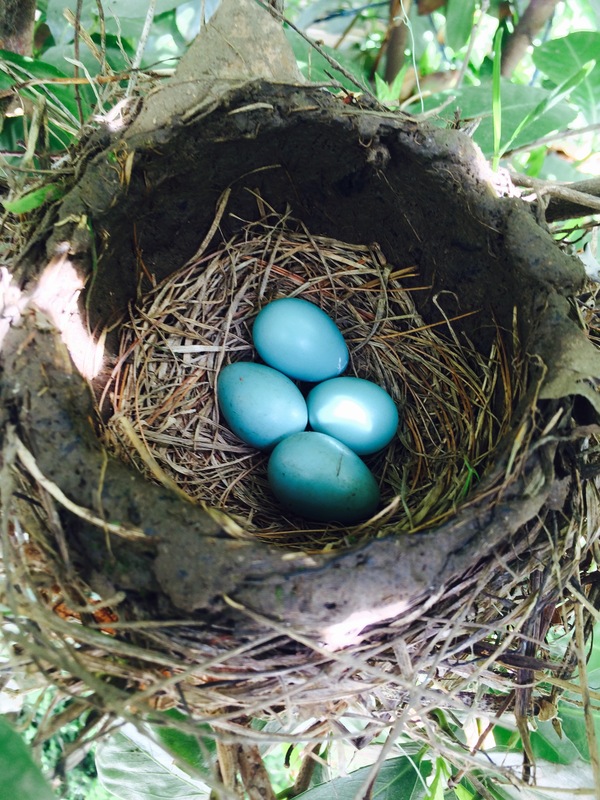 Meanwhile, out back, in an almost eye-level nest in our hedge, a mother Robin is sitting on 3, exquisite, turquoise-blue eggs. At least I thought she was sitting on 3 until I put a step stool up today to take a picture of them. I was startled to see a 4th that is even slightly bigger than the others! Strange, isn’t it how we’re such prisoners of our perceptions? We think we see things clearly but oftentimes have no clue. We even act on our tidbits of incomplete information only to have our actions become as misdirected as our perceptions. The Bible says that, “now we see through a glass darkly” and that’s about as good a metaphor as I’ve ever heard. Consider this, too: Physicists say that of all the world which we can see, touch, hear and experience, there is actually 85% more, “dark matter,” which completely eludes us. Why? Because it gives off no light and produces no wavelength. It would be completely undetectable if not for the fact that it experiences gravitational pull. We know this because it affects the things around it. This means we not only have ‘dark matter’ around us—we breathe it as well! Remember the tale about the 3 blind men and the elephant? One described its’ girth as, ‘a wall,’ another its’ tusk as, ‘a spear,’ and the last its’ trunk as, ‘a snake?’ One wonders if we really KNOW anything at all. Well, enough ‘dark’ thoughts. It’s a beautiful spring day and I’m off to see if that baby bird finally took flight. His wings have more underneath and around them than either he or we can imagine.